Angiogenesis inhibitors are drugs that prevent or slow down the process of angiogenesis. This is a natural healing process that the body uses to encourage the growth of new blood vessels. After injury or trauma to the body, it is helpful, but in some disease conditions it is very damaging. In cancer, for example, angiogenesis encourages a rich blood supply to tumours so that they grow faster and more vigorously. Using angiogenesis inhibitors to cut off that blood supply is a promising cancer treatment. 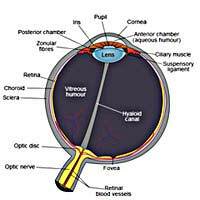 In the eye, angiogenesis occurs in response to tissue damage in the retina caused by a variety of eye problems. As the retina becomes damage, parts of it become short of blood and new blood vessels grow through the retina to try to restore the blood supply. These grow randomly and cause damage to otherwise healthy regions of the retina, causing irreversible damage and vision loss. Angiogenesis is a major factor in vision loss due to age-related macular degeneration, diabetic retinopathy, glaucoma, diabetic macular oedema and trachoma. Several drugs that inhibit angiogenesis have been trialled extensively to see if they can help slow the disease process in these retinal diseases. Most of them target a molecule called vascular endothelial growth factor (VEGF), which is produced when the eye is damaged and that acts directly to cause the growth of new blood vessels. Because the drug needs to work at the site of the retina, it is usually delivered there by an intraocular injection; a fine needle is used to inject the drug directly into the centre of the eyeball. This makes sure that the maximum concentration of the drug reaches the retina very quickly and does not affect other parts of the body. Ranibizumab is a monoclonal antibody that binds to VEGF and stops it from acting on the blood vessels in the eye. It prevents endothelial cells dividing and stops fluid leaking out of blood vessels nearby to the site of damage in the retina. It has been approved for use in age-related macular degeneration and also the swelling in the retina that can occur after the retinal vein has been blocked by atherosclerosis. Lucentis was approved for use in Europe for a third retinal disease, diabetic macular oedema, in October 2010. Pegaptanib works in a very similar way, by preventing VEGF having is effect on blood vessel growth, but is a molecule called an aptamer. This is a very short piece of RNA, a nucleic acid, which is able to bind to VEGF, stopping it binding to its own receptors in the eye. Pegaptanib is approved for use in age-related macular degeneration. Bevacizumab is another monoclonal antibody that prevents VEGF from encouraging blood vessel growth in the back of the eye. It was one of the first anti-angiogenic drugs to be developed but although it has shown good results in large trials carried out in patients with age-related macular degeneration, it is not yet approved for any of the retinal diseases. This is expected to change in the next couple of years. It is already approved for use in several cancers, including colon cancer, breast cancer, glioblastoma and lung cancer. Several trials are also underway to try to find the optimal treatment that can slow the loss of vision in people with any of the retinal diseases already mentioned. Preventing the action of VEGF is one very promising treatment but it may be even more useful when combined with a steroid medicine that is also delivered directly into the eye, and perhaps also when used with laser therapy.